The second of our speakers series on Reimagining Poverty is tomorrow! 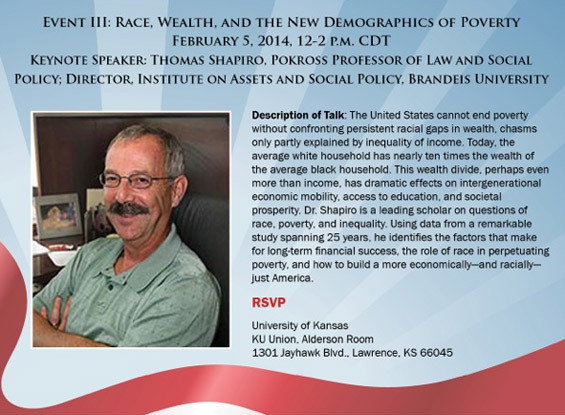 I’m excited to welcome Dr. Tom Shapiro to the university, and really looking forward to hearing him talk about race, poverty, and inequity. Dr. Shapiro’s work is pretty stunning; if you haven’t read Black Wealth/White Wealth, you really should. His scholarship exposes the extent to which differential access to institutions influences radically disparate outcomes for blacks and whites in the U.S. economy. For example, a $1.00 increase in income = a $5.00 increase in wealth for whites, but only $0.70 for blacks. Statistics like the above make it clear that that promise is largely being broken. Combating poverty in the U.S. absolutely requires acknowledging–and committing to dismantle–institutional racism. That’s not a reassuring realization, certainly, but it’s a critical one, and I am glad that we’re helping to spark that conversation. I feel like a lot of my work and, so, many of my reflections here, are converging now: the All-In Nation effort that I’ll be posting on in a few weeks, my alignment with the Kansas City Equity Profile team, my AEDI emphasis on the links between poverty and education. So Rich, So Poor makes the point that school quality is an antipoverty strategy, not only because making sure that every child has access to a quality education will equip American children to climb out of poverty, but, more importantly from a structural perspective, because taking school quality off the table as a driver of residential choice would deconcentrate inner-city poverty and dramatically reduce racial segregation. That could be a game changer. If educational reform is the seminal civil rights challenge of this generation, we must redouble our efforts to examine how the institution of education is failing children and families in poverty, from preschool through their heavily-leveraged college degrees. I hope you’ll join us tomorrow as we continue this conversation, either in person at the Kansas Union at the University, or following along on the live webstream from home. Let’s reimagine poverty, yes, but then let’s end it, so that, by the time they grow up, it exists only in my children’s imaginations. This entry was posted in Events and Calls to Action and tagged policy change, poverty, racism. Bookmark the permalink.